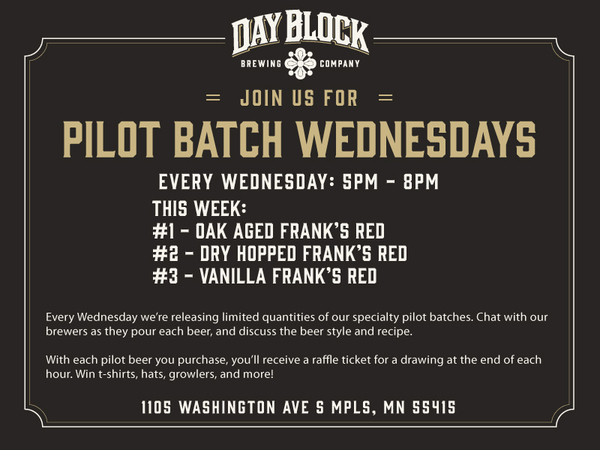 Frank's Red is a staple at Day Block Brewing, as it was one of the first recipes we built and it pays tribute to the history of our building. Our first beer is the Oak Aged Frank's. We soaked American oak spirals in bourbon and dropped them into our fermenter to create this intriguing style. Expect it to be rich and smooth, with hints of vanilla, oak, and spice. The second beer in our lineup is our Dry Hopped Frank's. We added Centennials hops to this beer after fermentation to give it a bright citrusy nose and a hint of fresh hop flavor. The last beer tonight is the Vanilla Frank's. Here we took sliced vanilla beans and soaked them in our fermenter. We expect the flavor to be subtle and not overpowering. Hope to see you tonight! Cheers!